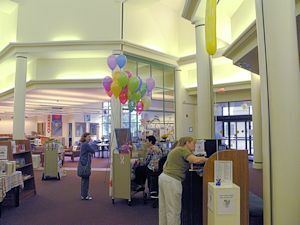 The William G. Rohrer Memorial Library of the Camden County Library System was dedicated in 1993, and 50 years of library service in Haddon Township was recently celebrated. The library is named in honor of William G. Rohrer, former mayor of Haddon Township, who left a generous legacy to be used in the development of a new and more spacious facility. The Rohrer Room exhibits materials highlighting the former mayor’s public service, business accomplishments and philanthropy. Several computers are available for public use as well as additional computers especially for children. The branch also has two rooms that can be reserved by the public – a meeting room and a story room. See photos of the Haddon Twp. Branch. More photos on Flickr.